Put your trust in a service in Cubitt Town with a customer satisfaction rating of over 96%! Q: What does the window cleaning in Cubitt Town consist of? Q: Who will rinse my windows? 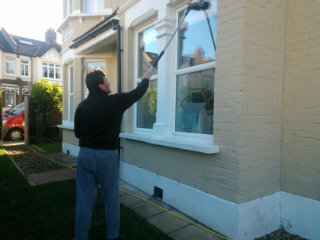 A: Our service will be carried out by experienced and police-checked Cubitt Town window cleaners. They'll also don branded uniforms, so you'll easily notice them as soon as they arrive at your property. Q: What is a water-fed pole system and how does it work? A: In essence, this is an extendible rod that spurts water under high water pressure. It allows the technicians to reach the fourth floor of any business or domestic building from the safety of the ground. Q: Will you connect your cleaning tool to my property's water source? A: Not at all! The team will use a special filtered water storage inside their vehicle. However, if the tank is empty, we will readily accept your offer. Q: Are there any requirements that I should meet beforehand? A: You must make sure that there will be a unoccupied parking space within 30 metres from your domain and on the same side of your panes. The professionals also need to have an effortless access to your property. With the intuitive water-fed rod gear, the professionals can help you overshadow your competition at fair prices. And you can press down our window cleaning Cubitt Town rates even further by mixing two or more of our washing services together! To learn the exact amount behind our price offers, make sure to stop by our convenient price table below. Irrespective of where your smudges have taken shelter, our capable window cleaning in Cubitt Town will fight them off with ease. We have covered a number of washing methods. Our external window clean is suited for buildings that do not exceed four floors. To let the sunlight back inside, the window cleaners in Cubitt Town will arrive in a caravan, equipped with a retractable water-fed rod. This system is linked to a water tank, filled with filtrated water. After being released as a powerful gush from the pole's brush-head attachment, the liquid will absorb all dust build-up in an attempt to regain its natural structure. To reach muddy window corners of multistorey properties, we'll send an established team for rope access window cleaning. These approved abseilers will utilize regularly checked ropes and harnesses or position ladders and cherry pickers to bring back the glamour of your panes. We've got all essential COSHH records in place and follow each and every safety instruction. To make the interior facet of your glass façade just as lustrous, the pros will rely on the ordinary ladder and sponge washing approach. Do any of your friends need help with washing away stubborn window stains? Scroll down to learn which regions the Cubitt Town window cleaners frequent. Alternatively, get a free instant quote or order affordable window cleaning services Cubitt Town E14 online, through our web site.